Demonstration Center Now Open — Energy Sciences, Inc. Seeing is believing and when you have great products, services and equipment, you want as many people as possible experiencing it all for themselves, firsthand. That’s one of the reasons Energy Sciences Inc. (ESI) has joined forces with Uteco Group to create a new demonstration center that is currently operational. 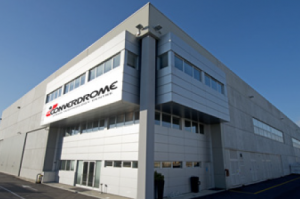 The new ConverDrome is located in Verona, Italy, and is the premier technology center for the latest developments and innovations in printing, converting and many other advanced applications. One of the many highlights of the demonstration center will be the new advanced Electron Beam CI-Flexo press that has a FlexoBeam Electron Beam from ESI. The CI-Flexo press is the future of flexible packaging converters because of its extremely small footprint and lowest profile for retrofit or new installations. Visitors to the ConverDrome will be able to see for themselves multiple new eBeam CI-Flexo ink technologies. Ready for a trial? Contact ESI right now: email sales@ebeam.com or call 978-694-9000. With EB CI-Flexo, you will be able to have better print quality for all of the demanding and ever-changing food applications, all while reducing or eliminating harmful VOCs.